Field wired unit includes one (1) 20A black tamper-resistant duplex receptacle. Comes with a brushed stainless steel finish. 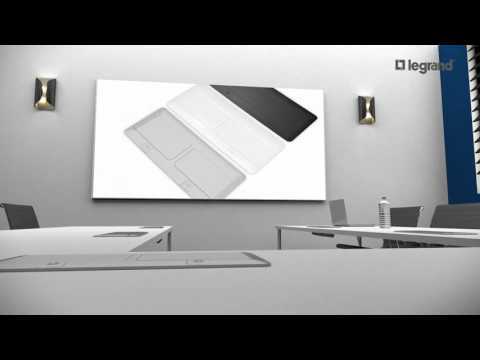 Sleek, Attractive Design – Slimmer, lower profile integrates well with table surfaces to enhance conference rooms, meeting rooms, hotel rooms, kitchens, and offices. UL Spill Water Protection – Meets or exceeds UL 111 - Outline of Investigation for Multioutlet Assemblies. Eliminates risk of shock or short circuiting due to moisture entering device. Tamper-Resistant Receptacles – Meets 2011 NEC TamperResistant requirements. Receptacles feature our patented shutter system that prevents the insertion of foreign objects for safety. USB Charging Capability – Duplex 3.1A USB receptacles provide charging capacity for a wide range of mobile devices. New Soft Opening Cover Mechanism – Opening and closing the cover is quieter and easier with a more professional feel. Multiple Cover Finish Options – Durable black powder coat and brushed stainless steel finishes blend with most decors. Expanded Configuration Options – Accepts full size receptacles which provides expanded custom flexibility. Consult factory for more information. cULus Listed – Meets UL US and Canadian Safety standards for Multioutlet Assemblies (File E15191, Guide PVGT). Also in compliance with NEC Articles 380 and 406.5(F) for use in work surface or counter top applications.